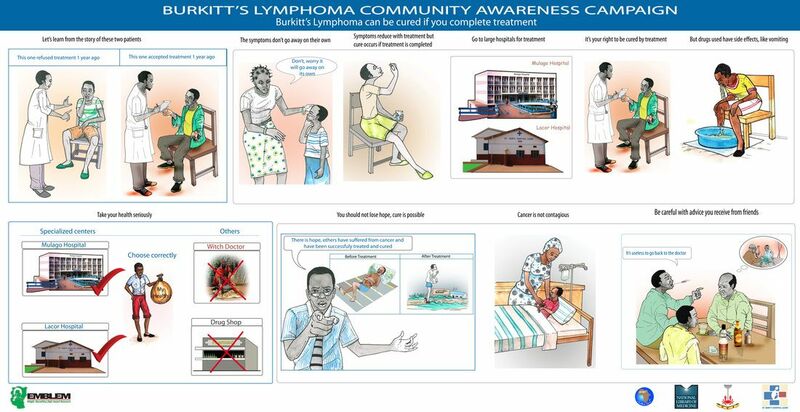 PROJECTS - Pennies Make A Dime Inc.
﻿Burkitt’s lymphoma is the most common childhood cancer in Africa. While this type of lymphoma is rare in the United States, it is responsible for 50% of cancer deaths for children in west/East African countries such as Nigeria, Ghana, Uganda, Kenya and Tanzania. Burkitt's ﻿lymphoma is the fastest growing tumor in humans with a cell doubling time of 24 hours. Beneficially, this fast growth rate also makes Burkitt’s very responsive to chemotherapy. In Africa, the average age of a child diagnosed with Burkitt’s is five, with some patients seen as young as 18 months old. “More than 85 percent of these children could be cured for less than $600 a case,” according to Dr. Corey Casper of the Fred Hutchinson Cancer Research Center in Seattle. Endemic Burkitt Lymphoma- This type of Burkitt lymphoma affects children who are suffering from malaria, especially in endemic regions like Africa. Endemic Burkitt Lymphoma is associated to minimal resistance to a virus called Epstein-Barr virus (EBV). Glandular Fever is caused by the EBV virus. The endemic Burkitt lymphoma is also known as African lymphoma. It affects distal ileum, jaw bone, breasts, ovaries, cecum or kidneys. Sporadic Burkitt Lymphoma- This type of Burkitt lymphoma is closely associated to the cancer cells of endemic Burkitt lymphoma. In rare instances, the sporadic Burkitt lymphoma is associated to the EBV virus. The ileocecal region is associated with this type of Burkitt lymphoma. It is commonly found in UK and is also known as non-African type. Immunodeficiency Burkitt Lymphoma- This type of Burkitt lymphoma is commonly found in patients whose immune system is suppressing due to certain type of drugs or have undergone an organ transplant surgery. The initial stages of HIV or AIDS may be linked to Immunodeficiency Burkitt lymphoma. Clement Quaison is a two years old boy diagnose with a tumor on the left chest, the mass increases in size as he age. He suffers chest pain and trauma. He was admitted to Korle-Bu Hospital in Accra, Ghana when he was 8 months old and has undergone several treatments. His doctors advise he needs urgent surgery to prevent damages to his heart due to the location of the tumor. Clement's surgery is estimated to cost $3,500.00. However, with his medications and other postoperative expenses we hope to raise $5,500.00 for him. Clement's only support system is his grandmother, a petty trader who lives in Cape Coast, Ghana. VIM-Volunteer Inspire Make a difference Inc. together with Pennies Make A Dime Inc. are asking for your support to help raise money for Clement's surgery. Habitat for Humanity seeks to become a lead organization in the provision of housing solutions in Ghana to enable every Ghanaian have decent, safe and affordable house. Habitat for humanity (HFH) Ghana´s programs currently focus on Housing Microfinance with Housing Support Services; advocating for change in government housing policies and systems to positively impact the poor; and building the capacity of artisans at the district and community level to deliver quality houses through a Housing Resource Center. HFH Ghana works on renovation/repairs of existing houses and construction of new houses. Home repairs or renovations include but are not limited to the provision of a utility block or sanitary sewer system, roofing, addition of rooms, etc. Families work with Habitat Staff to develop individual plans to ensure the proposed plans meet their needs and fit within their budget. For new construction, the typical HFH Ghana houses consist of 2 rooms, kitchen, bathroom, and toilet. Go to www.gofundme.com/penniesmakeadime and designate your gift to Habitat Ghana. For years Pennies Make A Dime Inc. has served as a collection hub for new and used clothing and footwear donations, which are distributed to children in Africa who are in need. With the recent flood in Ghana ... we collected eight barrels of clothes and shoes. Donations can be brought to Patience Roberts. I can be reached via phone 718 696 7461 for pick up. Thank you in advance for your generosity. PMAD's "Back to School program", which was first introduced in 2017, is a program by which members of the organization partner with the company to furnish backpack and school supplies to underserved children in the local areas to lift their spirits and increase their confidence in the classroom. PMAD works with local nonprofit social service organizations to identify recipients. Participating children were provided with school essentials, including backpacks filled with classroom supplies, books, and hygiene products donated by Pennies Make a Dime Inc. This year we served over 40 children in the Newark, Delaware community,. Free Back to school supplies helps children start the year prepared to study. These year we served over 60 to 70 students from pre k to high school. The students were provided school essentials, such as backpacks filled with classroom supplies, books, and hygiene products donated by Pennies Make a Dime Inc.
Free Back to school supplies helps children start the year prepared to study. Join us for our 1st Annual PMAD fundraiser gala on July 21, 2018, 6:00pm at Executive Conference and Banquet Center. 205 Executive Drive Newark DE, 19702. The theme for this year’s gala is “Keep Hope Alive”. Our goal is to raise $10,000, benefiting Pennies Make a Dime Inc. for scholarship and developmental programs in Africa. We believe every money raised/ donated will make a difference in a child's life, therefore on Saturday, July 21, 2018, any amount contributed will be greatly appreciated in reaching our goal. Tickets are on sale now via eventbrite, our website www.penniesmakeadime.org or contact our sales reps at 718 696 7461. Individual ticket $50 and couples $95. There will be a live band performance, auction, raffles, networking, a surprise guest from Ghana, and lots of entertainment. Pennies Make a Dime Inc is a 501(c)3 nonprofit organization. All contributions to the foundation are tax-deductible. If you need more information please contact Patience, Lovelace, and George @ info@penniesmakeadime.org or visit our website www.penniesmakeadime.org. This event is open to all.